The observatory was opened Tuesday, 5 February 2013, at 1806 MST, 69°F. Viewed Mercury at 1811 MST using 77X, 206X, and 364X. Mercury remains low in the sky but was better this night than on the previous night. Using 206X, a gibbous phase was visible. At 1817 MST, viewed Jupiter, 77X. Four moons were visible. At 1820 MST, viewed Mars and Mercury using 7x50 binoculars. Both were well in the same FOV. 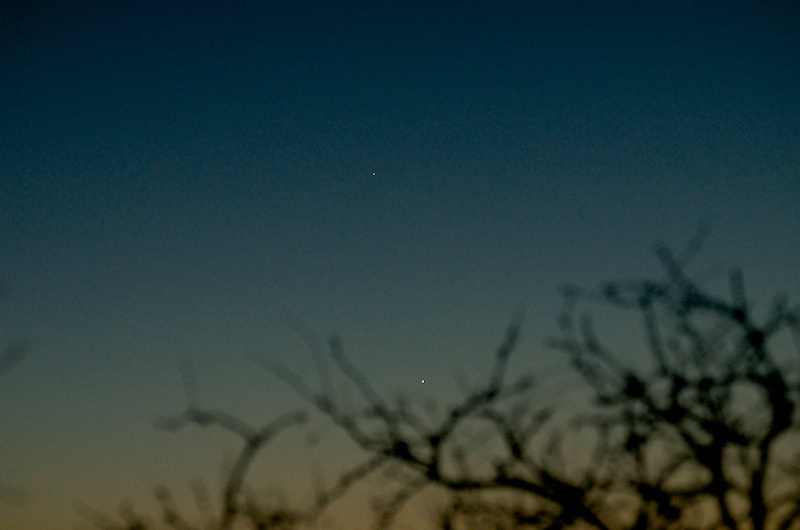 I then picked up both planets with the naked eye. Mercury was easy, but Mars was very difficult to see at 1820 MST. This photo shows Mars (top) and Mercury (bottom), and was taken with the D7000 DSLR at 1842 MST, f/5.6, 1/20sec, ISO 400, 155mm. 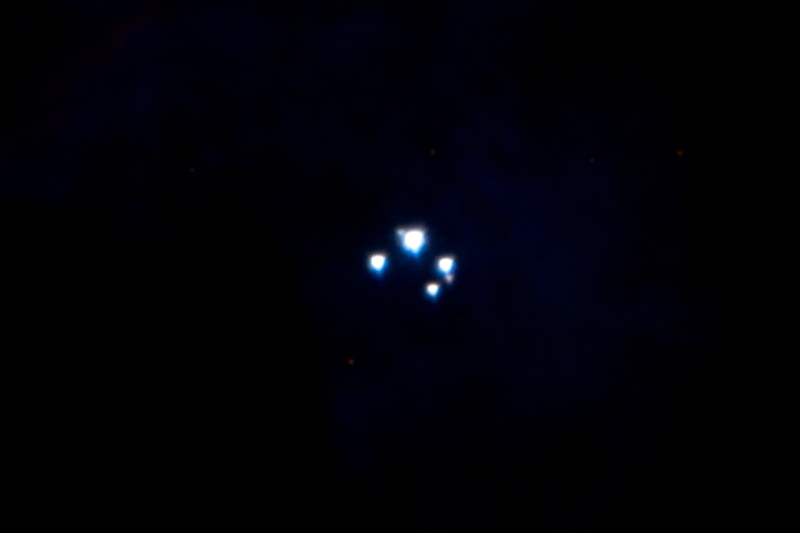 I ended spectra imaging at 1954 MST, and since the constellation of Orion was well placed for viewing, I did an AutoStar tour of DSOs in Orion using 77X. 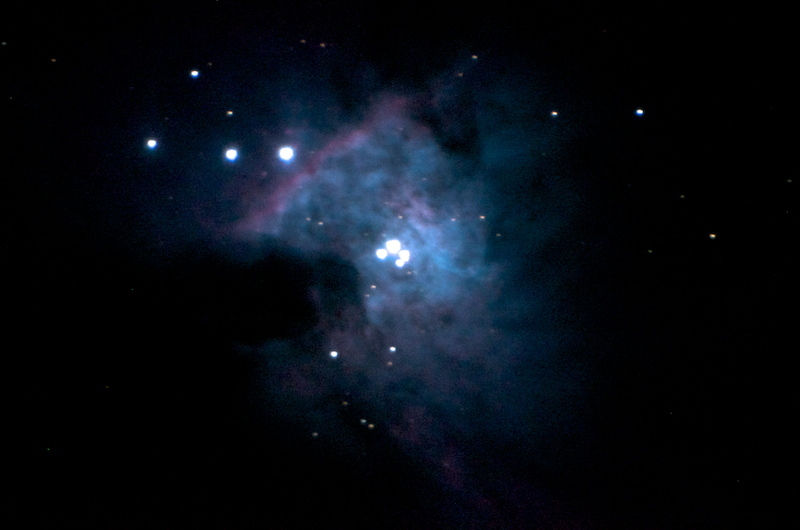 Viewed the following nebulae: M42 (Great Orion Nebula), M43, NGC1977 (Running Man Nebula), NGC1990, NGC2024 (Flame Nebula), IC434 (Horsehead; yes, I saw it this night), and M78. I also viewed the open star cluster NGC2194. I closed the observatory at 2102 MST, 52°F. Comments are welcome; use the Comments section below, or you can Email Me. Thanks. Go to the previous report. Return to the Cassiopeia Observatory Home Page.